It’s been a busy holiday season so far, definitely weighted toward the week before Christmas through today. Tom and I had to say goodbye to Michael yesterday, and Liz, Savannah and Ryan this morning. Cynnie lives nearby but we have seen a wonderfully lot of her since her sister and step-brother have been home. We will be back into our regular schedule of events and responsibilities Monday. Today and tomorrow are days of rest. However, I had intended to post the past 5 years of holiday cards before Christmas, and did not get to that task, so here they are, still fitting into the 12 Days of Christmas. 2009 was my first year of homemade holiday cards. 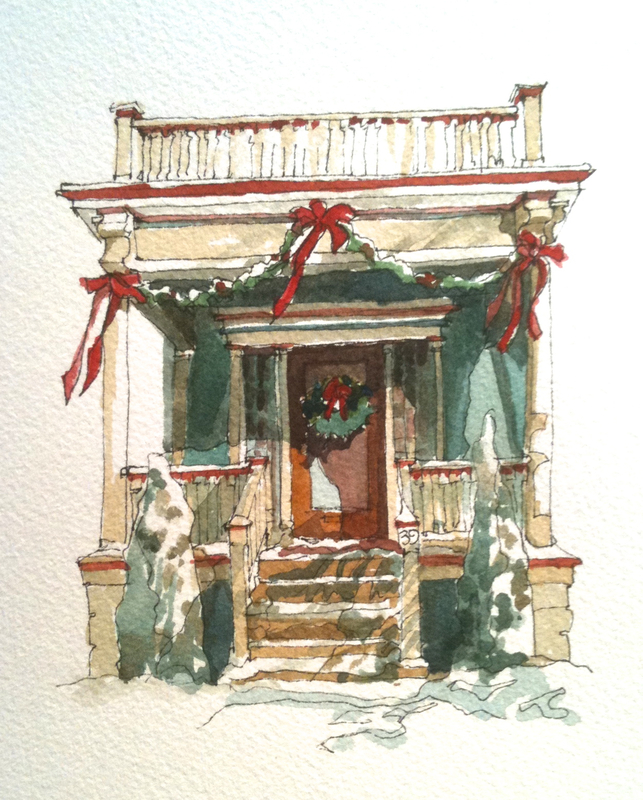 I painted watercolor on a pen and ink drawing of our front porch decked out for the holidays. We live in a 1903 victorian two family, a beautiful place, in the Elmwood Village Neighborhood of the City of Buffalo. 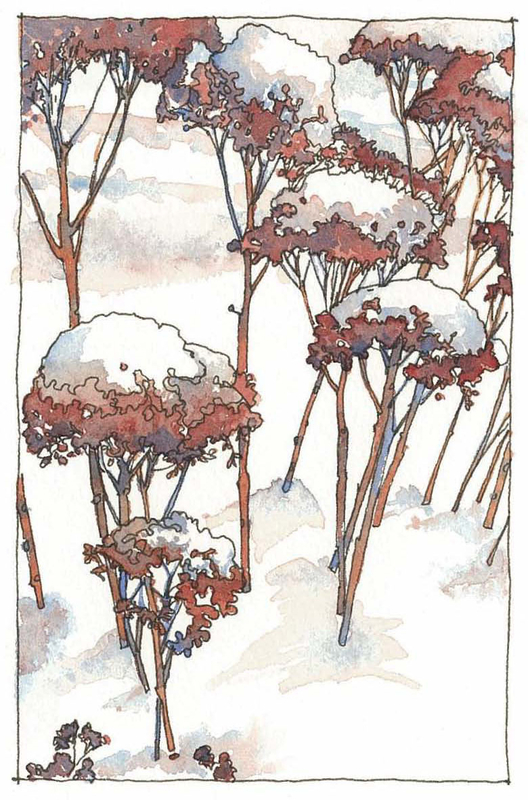 In 2010 I was taken by the snow on a neighbor’s sedum. This card has been called a takeoff on a Japanese wood cut. I love that, and consider it a compliment since I studied printmaking as a college student, and have always loved Japanese artwork. 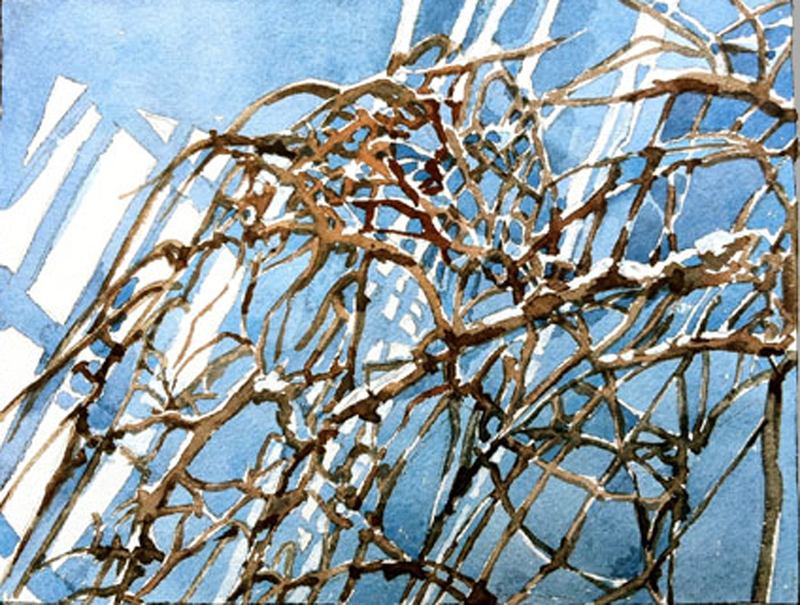 2011 was a busy year, and I was lucky enough to have already painted this watercolor painting of the weeping mulberry in our backyard covered with snow. It’s a view I have from my breakfast table in our kitchen. I love the patterns of light and shadow on the snow. In 2012 I had time to dig through the many photos Tom and I have both taken of our backyard garden in all four seasons. 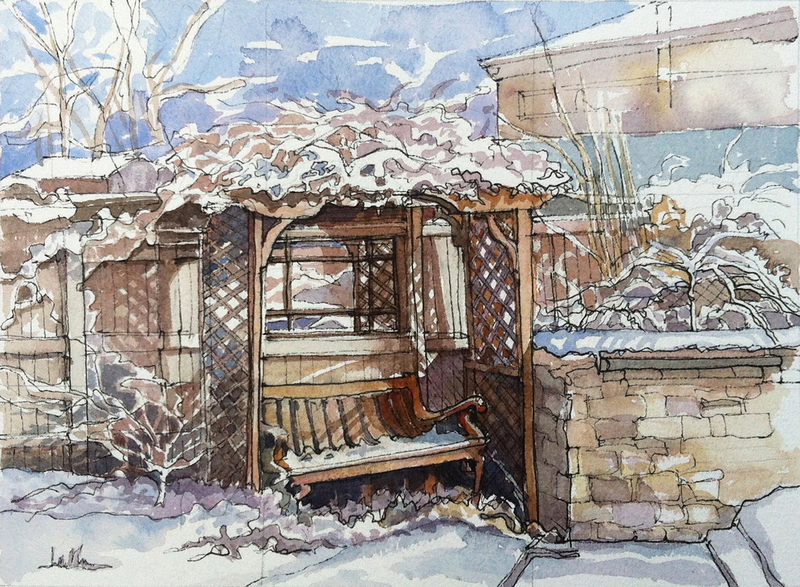 This watercolor and pen and ink winter scene is of the grape arbor sheltering our resting bench next to the pond and wall Tom created. 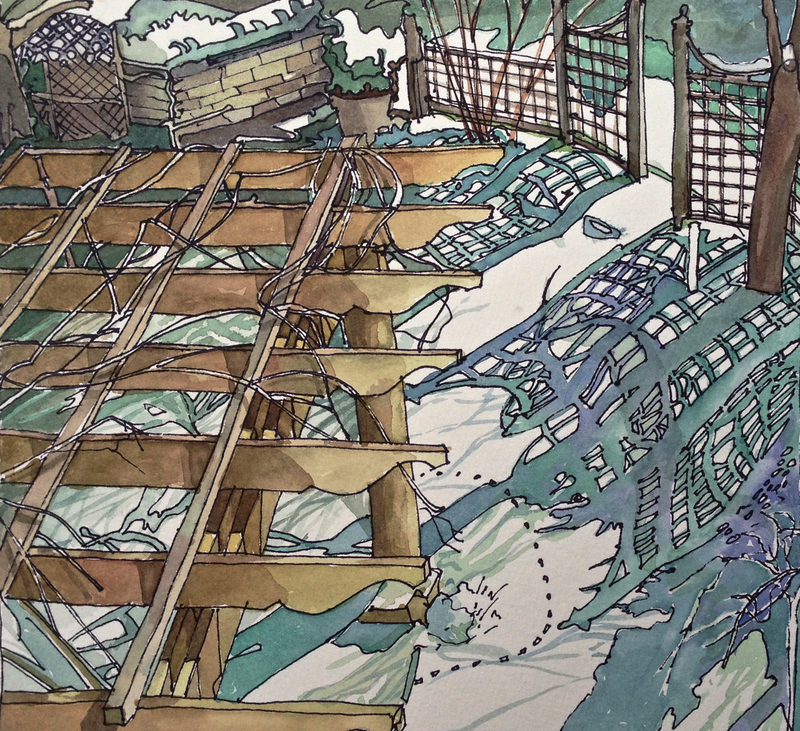 2013 presented another incredibly busy fall and early winter, so I went back to an ink drawing I had started a year or so before, finished the drawing concentrating on the patterns of shadow from Tom’s fencing, and added watercolor. The pergola is the structure that Tom and I designed together. He built it in his shop in the basement. What an incredible talent he has for planning and design. I’m good with ideas, but I like to have the option of being able to change my direction as often and whenever I want! Not good if you are building a pergola! Good if you are painting! It was a challenge to be an architect. I am very happy to have retired in 2010! 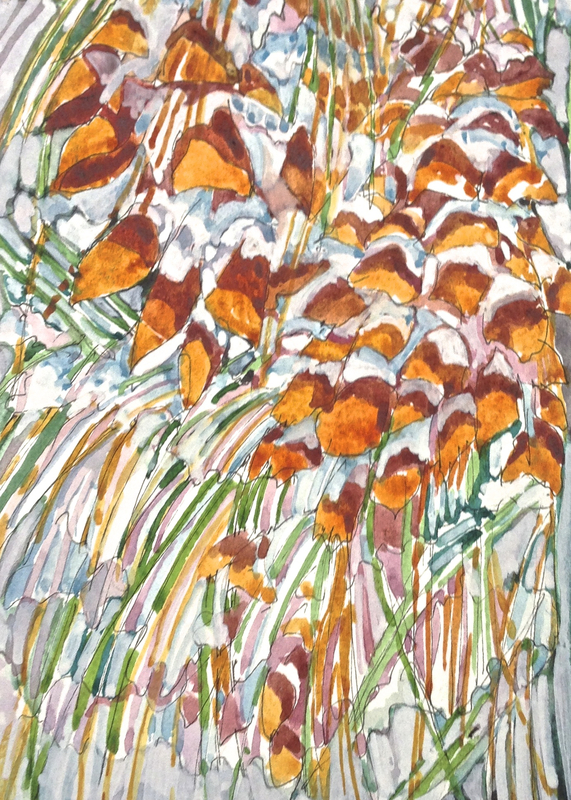 This is this year’s card which I labelled on the back “Pine Cone Abstraction” because after I had finished it and had sent it off to Vistaprint, Tom looked at it and said -“I like it, but I have to admit that I don’t know what it is. Sorry.” I like it too, full of light, and cheery. It’s watercolor and gouache on a pen and ink drawing. So, there they are. I hope everyone had a wonderful, family and friend-filled holiday, full of shared good times and memories. It was lovely here, but I love the quiet house.